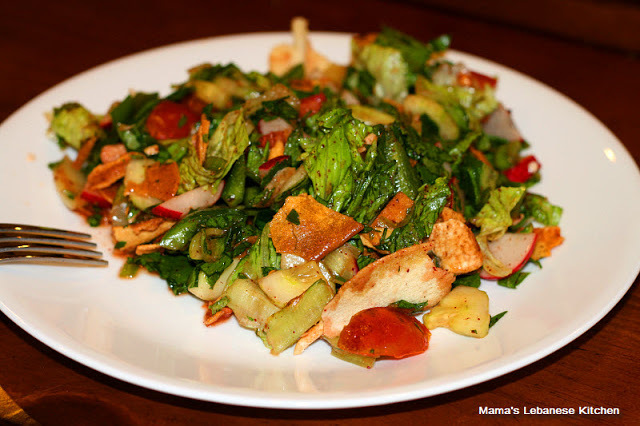 The Lebanese kitchen carries many crowns, and Fattoush salad is one of them. What distinguishes Fattoush are 2 main aspects: the number of greens and vegetables it carries, and the complex rich flavor that the pomegranate molasses and/or sumac spice engulf it with. Fattoush is the official Lebanese peasant salad, and farmers just throw in whatever spring/summer harvest they have into the bowl to build up this beauty. For this reason, you may find “typical” ingredients for Fattoush, however the list of veggies can vary quite a lot. Fattoush Salad is Lebanon's peasant salad. A rich, complex taste emanates from the rainbow of veggies and the tanginess of its dressing. 1. Use fresh, organic veggies if possible. Rinse all veggies thoroughly with cold water or veggie wash. You could also soak them in cold water and a cup of white vinegar for a few minutes to kill any bacteria. 2. Separate the pita bread leafs, sprinkle a bit of sumac and olive oil on them, cut them into 1x1 inch squares, and toast them in the oven until they are light brown (bake for ~ 3-5 mins on 400F). Put aside. 4. Chop the Persian cucumbers into disks of ¼ to ⅓ of an inch thick. If Persian cucumbers are not available, use English or regular cucumbers and chop into smaller pieces since they have a larger diameter naturally. 5. Chop onions into small disks of about ⅓ inch long. 6. Green Mint and Italian Parsley:remove stems, and chop leaves in halves or thirds. You don't want the pieces to be too tiny or too large. 7. Red Radish: chop into thin disks. 10. Garlic: crush garlic with a dash of salt, put aside. 1.Mix immediately before serving so the salad doesn't get soggy. Place all vegetables in a bowl, add the mashed garlic, pomegranate molasses, freshly squeezed lemon juice, sumac and salt and mix well with the veggies. 2. Then add the toasted bread and olive oil and mix again, gently so the bread doesn't break much. 3. Add the olive oil at the end, mix gently then serve.